The peach flavor region of chromosome 4 is chosen as one of RosBREED's "Jewels in the Genome.” Knowledge of the chromosome-4 flavor locus will allow breeders to predict taste attributes, making the selection of desirable eating quality peaches more efficient. Peach flavor is influenced by a delicate balance of sugar, acid content, and aromatic volatiles. Developing flavorful peaches is a high priority for breeding programs (Fig. 1). However, obtaining the optimum combination of these desirable taste attributes is challenging, as their genetic control is complex. Several studies, in different populations and over multiple years, identify a region on peach chromosome-4 containing genetic variation for sugar (Fig. 2) and acid levels in peach breeding germplasm. This region of peach chromosome-4 has been associated with the levels of three sugars (fructose, glucose and sorbitol) and three acids (malic, citric and quinic) (Quilot et al. 2004; Dirlewanger et al. 2006). Understanding this region allows breeders to predict peach taste attributes. Figure 1. 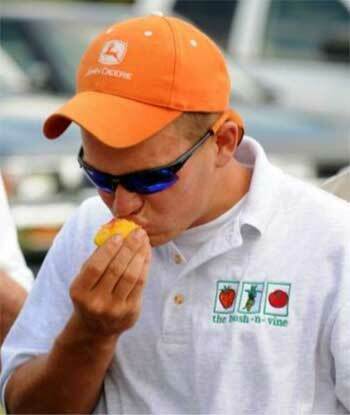 South Carolina grower, Sam Hall enjoying a flavorful peach. Photo credit: Ksenija Gasic, Clemson State University. Figure 2. 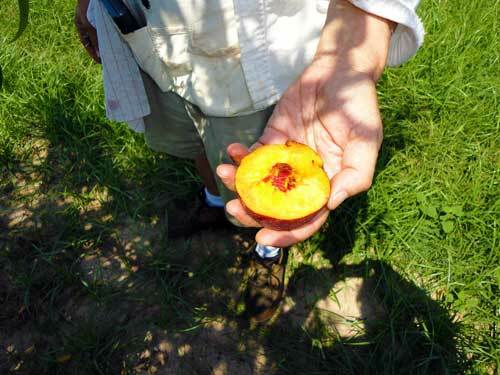 Dr. William Okie (peach breeder) sampling a peach for percent sugar. This peach measured very high! Photo credits: Ksenija Gasic, Clemson State University. Dirlewanger E., Cosson P., Renaud C., and R. Monet. 2006. 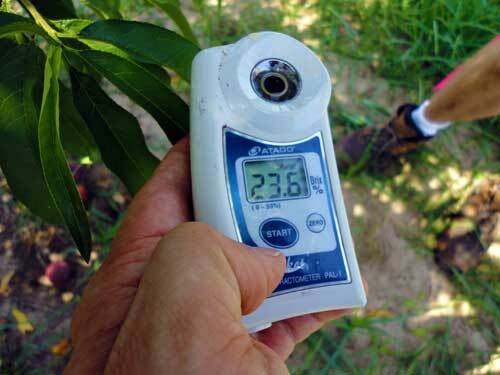 New detection of QTLs controlling major fruit quality components in peach. Acta Horticulturae: 713: 65-72. Quilot B., Wu B.H., Kervella J., Genard M., Foulongne M., and K. Moreau. 2004. QTL analysis of quality traits in an advanced backcross between Prunus persica cultivars and the wild relative species P. davidiana. Theoretical and Applied Genetics: 109: 884-897.